[174 Pages Report] Molecular biology enzymes are natural proteins produced by living organisms (animals, plants, and bacteria) and are highly selective biochemical catalysts. Molecular biology reagents are chemicals used in molecular biology reactions to optimize the workflow. The global molecular biology enzymes and kits & reagents market is projected to reach USD 13.60 Billion by 2022 from USD 5.69 Billion in 2016, at a CAGR of 15.8% during the forecast period. Base year considered for the report is 2016. Forecast period considered for the report is 2017–2022. Growth in the molecular biology enzymes and kits & reagents market is driven by factors such as increased research activities and R&D investments in the life science industry, rising number of genome projects, technological advancements in the life science industry, and rising incidence of infectious diseases & genetic disorders. However, limited reimbursements for genetic testing is expected to restrain the growth of this market during the forecast period. The major players in the global molecular biology enzymes and kits & reagents market are Thermo Fisher (US), Merck (Germany), Illumina (US), QIAGEN (Netherlands), New England Biolabs (US), Promega (US), Agilent (US), Roche (Switzerland), Takara Bio (Japan), Bio Basic (Canada), Jena Bioscience (Germany), and Molecular Biology Resources (US). * Other applications include mutagenesis, in vitro transcription, and molecular labeling & detection. **Other end users include contract research organizations (CROs), food & beverage companies, and forensics. The global molecular biology enzymes and kits & reagents market is projected to reach USD 13.60 Billion by 2022 from USD 6.52 Billion in 2017, at a CAGR of 15.8% during the forecast period. The growth of this market is majorly driven by factors such as increased research activities and R&D investments in the life science industry, rising number of genome projects, technological advancements in the life science industry, and rising incidence of infectious diseases & genetic disorders. 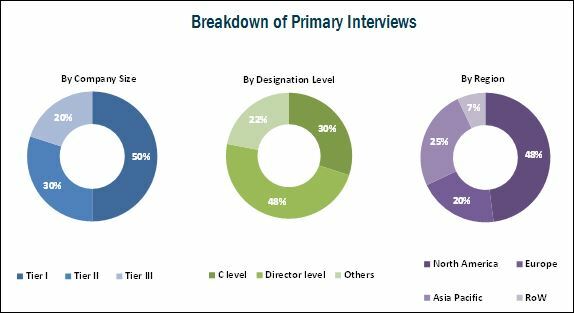 The molecular biology enzymes and kits & reagents market is segmented on the basis of product, application, end user, and region. On the basis of product, the global market is segmented into enzymes and kits & reagents. 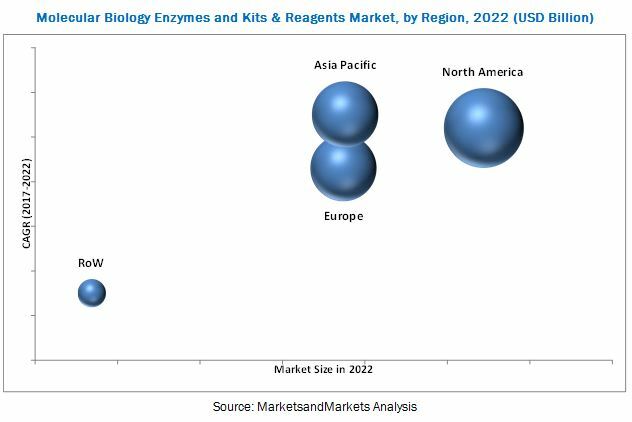 The enzymes market is further subsegmented into polymerases, ligases, restriction endonucleases, reverse transcriptases, phosphatases, proteases & proteinases, and other enzymes (T4 polynucleotide kinases, exonuclease III, methyltransferases, glycosylases, and agarase). The kits & reagents segment is expected to account for the largest share and register the highest CAGR during the forecast period. This can be primarily attributed to the requirement of repeat purchase of these single-use products and increasing drug research in the pharmaceutical industry. Based on application, the market is segmented into polymerase chain reaction (PCR), sequencing, cloning, epigenetics, restriction digestion, synthetic biology, and other applications (mutagenesis, in vitro transcription, and molecular labeling & detection). The sequencing segment is expected to grow at the highest rate during the forecast period primarily due to the increasing DNA sequencing with growth in genomic research, rapid technological advancements, decreasing costs of sequencing, and growing use of whole-genome sequencing and personalized genome sequencing. In 2017, the PCR segment is expected to hold the largest share owing to high demand for PCR equipment by a majority of end users. Based on end user, the market is segmented into academic & research institutes, pharmaceutical & biotechnology companies, hospitals & diagnostic centers, and other end users (contract research organizations, food & beverage companies, and forensic agencies). The hospitals & diagnostic centers segment is expected to grow at the highest CAGR during the forecast period. This can be attributed to the increasing adoption of molecular diagnostics and the rising prevalence of disorders that require molecular biology assays (that use kits) for diagnosis. The geographic segments in this report include North America, Europe, Asia Pacific, and RoW. Of these, the North American segment is expected to account for the largest share of the market in 2017. The large share of this segment can primarily be attributed to the increasing research funding for genomics research, rising number of pharmaceutical and biotechnology companies, increasing prevalence of conditions involving molecular diagnostics, and rising investments in research projects in Canada. The limited reimbursements for genetic testing is expected to restrain the growth of this market during the forecast period. The major players in this market include Thermo Fisher (US), Merck (Germany), Illumina (US), QIAGEN (Netherlands), New England Biolabs (US), Promega (US), Agilent (US), Roche (Switzerland), Takara Bio (Japan), Bio Basic (Canada), Jena Bioscience (Germany), and Molecular Biology Resources (US). 11.12 Molecular Biology Resources, Inc.